This is 5 rubles showing the Uspensky Cathedral, Moscow. The coin is not proof, otherwise the surfaces would look mirror like. 2.6 million were struck, the metal composition is copper-nickel. The value does not exceed the price tag. Sigi . Hi Mihaizaha, thank you for showing the coins. They are quite nice - above average. 1758 is not easily encountered. It was EM's 1st year of the big coppers and I still have to see a perfect strike. Happy hunting Sigi . Hi Eugene, thank you for the rectification. I did not know the firebird either. 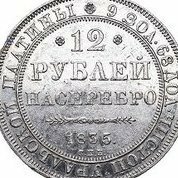 As promised I copied the JRNS article "THE ST.PETERSBURG RUBLES OF TIMOFEI IVANOV 1757-61. That was 10 pages in the journal, too much to enter here, I'm afraid. So I sent it to you as a PM. I WILL BE PLEASED TO SEND THE ARTICLE TO ALL INTERESTED COIN PEOPLE UPON REQUEST. Sigi . Conros and Wolmar catalogs list only one rouble type for 1760 (i.e. the common Dassier silver rouble eagle of the previous years). For the 1761 rouble there is also just one entry, depicted is the copper eagle. Obviously, a few copper eagle roubles were already struck in (late) 1760. I got the complete set of JRNS journals on my attic. Will copy the Julian article the next days. Till then, Sigi . Thank you Eugene, it took you quite a lot of work but I can see the distinctions, too, now. I wonder how it is possible to get aware of a tiny feature like this. For me the loop is more eyecatching and of course distinct differences of the eagles' design. You made an interesting discovery! It leads me to look closer. Unfortunately the majority of these coins are too worn or/and poorly struck to reveal minor features. I appreciate your research Sigi . I am sorry, Eugene but I am not sure about your point There is a little stem between the leaves and the loop, the lowest inner leaf is slightly apart - is that it? I cannot detect much difference. Sigi .